Chaotically Precise: Life, Love, and Melanoma: ERK inhibitor - (BVD-523) Ulixertnib. A new approach to targeted therapy for melanoma? Here's hoping!!! ERK inhibitor - (BVD-523) Ulixertnib. A new approach to targeted therapy for melanoma? Here's hoping!!! 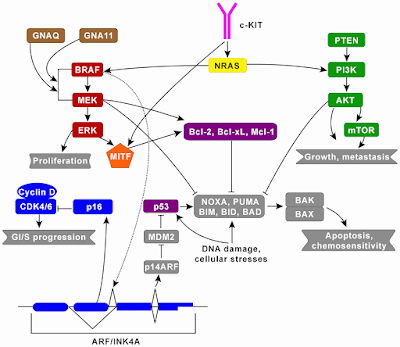 Targeting the MAPK Signaling Pathway in Cancer: Promising Preclinical Activity with the Novel Selective ERK1/2 Inhibitor BVD-523 (ulixertinib). Germann, Furey, Markland, et al. Mol Cancer Ther. 2017 Sep 22. 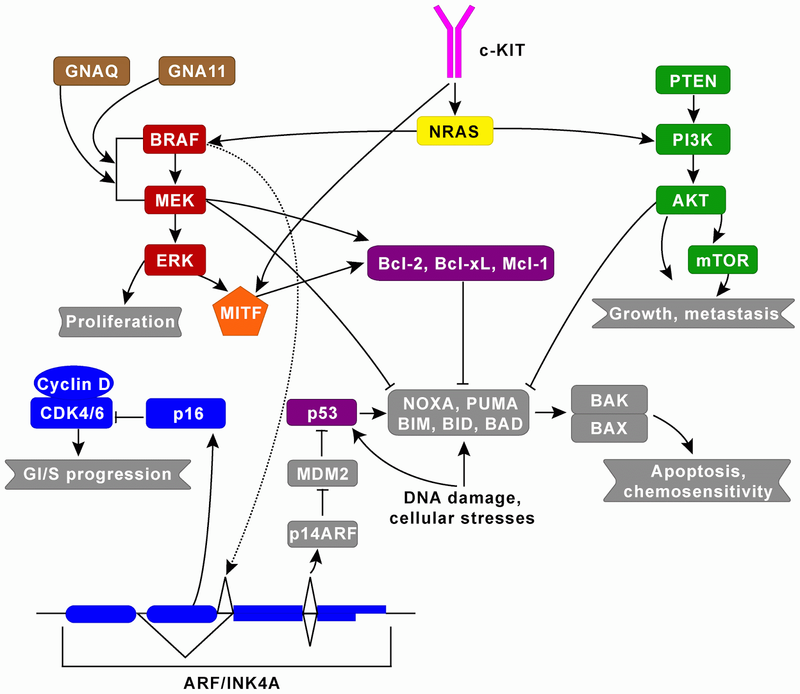 Aberrant activation of signaling through the RAS-RAF-MEK-ERK (MAPK) pathway is implicated in numerous cancers, making it an attractive therapeutic target. Although BRAF- and MEK-targeted combination therapy has demonstrated significant benefit beyond single-agent options, the majority of patients develop resistance and disease progression after approximately 12 months. Reactivation of ERK signaling is a common driver of resistance in this setting. Here we report the discovery of BVD-523 (ulixertinib), a novel, reversible, ATP-competitive ERK1/2 inhibitor with high potency and ERK1/2 selectivity. In vitro BVD-523 treatment resulted in reduced proliferation and enhanced caspase activity in sensitive cells. Interestingly, BVD-523 inhibited phosphorylation of target substrates despite increased phosphorylation of ERK1/2. In in vivo xenograft studies, BVD-523 showed dose-dependent growth inhibition and tumor regression. BVD-523 yielded synergistic anti-proliferative effects in a BRAFV600E mutant melanoma cell line xenograft model when used in combination with BRAF inhibition. Antitumor activity was also demonstrated in in vitro and in vivo models of acquired resistance to single-agent and combination BRAF/MEK targeted therapy. Based on these promising results, these studies demonstrate BVD-523 holds promise as a treatment for ERK-dependent cancers, including those whose tumors have acquired resistance to other treatments targeting upstream nodes of the MAPK pathway. Assessment of BVD-523 in clinical trials is underway (NCT01781429, NCT02296242 and NCT02608229).